Casper is a 10-year-old longhaired male cat who was brought to Lollypop Farm because someone in his family was allergic to cats. He's currently sharing a housing area with several other cats and is getting along well with everyone. In his former home, Casper lived with other cats and a dog, but he would prefer a dog-free household. 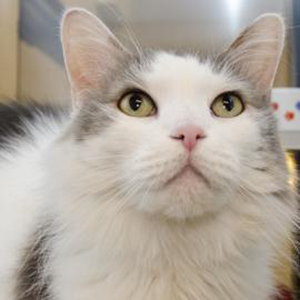 Casper is a friendly lap cat who likes to talk! He's available in Lollypop Farm's Seniors-for-Seniors program, so adopters age 60 and older can take him home free of charge! Last week's pet, Snow White, is still available.